The Parish Church of St Mary-the-Virgin is located at the top of the High Street in West Malling. The tower and the western part of the chancel remain from the original Norman church that was built by Bishop Gundulph nearly 1,000 years ago. The Chancel (the area where the High Altar stands) is unusually long and was lengthened in the 13th century. The Nave (the area where people sit) and the Chancel both being rebuilt at that time in the early English style. The frame of the Chancel Roof appears to be very old and may well date from the same period. Thanks to that lightning storm in 1712 which set the spire ablaze and brought it crashing down onto the church, the middle part of the church was almost entirely rebuilt. The initial repairs were not sufficient and the building deteriorated throughout the 18th Century until it was properly rebuilt for 1778. Having a spire in the first place was not original to the design of the church and had been added much later to the Norman tower on which it now sits. The height of it is 70 feet and from the base of the tower to the very top of the spire – 120 feet. The spire is famous in itself after it appeared on the £10 note for a period during the 1990s. The Georgian building served for around 120 years until, in the Victorian era, the community in West Malling at the time decided to take down the nave stone by stone in order to replace the building with one that they said was ‘more suited to the better taste of our own generation’. On the 27th of November 1901, the new nave was formally consecrated by Dr William Temple, the Archbishop of Canterbury. 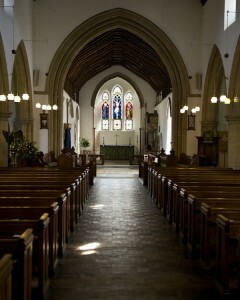 It is in those West Malling Victorians’ choice of church style that we continue to worship today. Most of the renovations carried out at that point were paid for through the sale of the Malling Jug. Amongst the church furniture is an interesting coat of arms for King James II. It is a remarkably lavish piece, finely carved in the style of Grinling Gibbons with a detached label ‘Fear God, Honour the King’. The royal monogram J R I I can be seen on the bottom corners. The anchor in the coat of arms commemorates the fact that as Duke of York, the King had been Lord High Admiral. 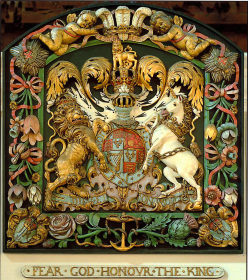 The coat of arms was restored in 1966 and the original colouring recovered. Sadly, in 2001, the coat of arms suffered an arson attack which also destroyed the High Altar. Thankfully the coat of arms survived and was restored to its former glory. St Mary-the-Virgin Church in West Malling remains a place of beauty, great history and peace. For nigh on one thousand years, it has been a place of prayer, a place where children have been welcomed as baptised babies, young couples have exchanged vows in love and loved ones have been laid to rest, and a place that has served as a hub for our community. It is our prayer in this day that it would continue to be so for many more years to come. If you haven’t had the chance to see the view from the top of St Mary’s Church Tower, you may enjoy this short clip that was filmed during the snow of 2010. The view shown looks north towards the North Downs, the rooftops of West Malling’s High Street, and South East towards Manor Park Country Park and Kings Hill.